Bishop Matthew H. Kukah, a noted Nigerian advocate for justice, democracy and human development, will speak at the University of Notre Dame on Oct. 29 (Thursday). His lecture, “Religion, Human Development and Democracy in Africa: Lessons from Nigeria,” is sponsored by the Kellogg Institute for International Studies. Free and open to the public, the lecture will be held at 4 p.m. in the Hesburgh Center Auditorium. 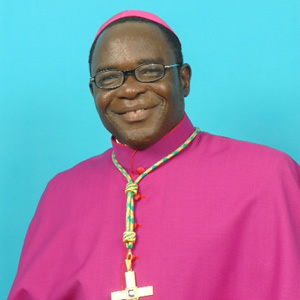 A respected scholar as well as the bishop of the Diocese of Sokoto, Nigeria, Kukah has played an active role in Nigerian civil society and is well-known in Africa and beyond as a champion of respectful Christian-Muslim relations. He has served on Nigeria’s Truth Commission, the Political Reform Conference for Nigeria and the country’s Electoral Reform Committee and helped to negotiate an end to the Shell-Ogoni conflict in Nigeria’s delta region. He chaired the Committee on Interreligious Dialogue in Nigeria and West Africa and was appointed by Pope Benedict XVI as a member of the Pontifical Council for Interreligious Dialogue. In his lecture, Kukah will discuss how Christian and Islamic religious institutions and religious beliefs have promoted or inhibited integral human development and how religious institutions or universities might better promote such development. During his visit to Notre Dame, Kukah will also take part in the panel “Christianity, Islam and Liberal Democracy: Lessons from Sub-Saharan Africa” at 4 p.m. Tuesday (Oct. 27) in C103 Hesburgh Center. He will be joined on the panel by Kellogg Faculty Fellow Rev. Robert Dowd, C.S.C., assistant professor of political science and director of the Ford Family Program in Human Development Studies and Solidarity; Sara Sievers, associate dean for policy and practice in the Keough School of Global Affairs; and Ebrahim Moosa, professor of Islamic studies, Kroc Institute for International Peace Studies and Department of History. Kukah has written widely on democracy, religion and politics in Nigeria. He holds a Ph.D. in political science from the School of Oriental and African Studies, University of London, and has been a senior Rhodes fellow at St. Antony’s College, University of Oxford, and an Edward Mason Fellow at the Kennedy School of Government, Harvard University. The Kellogg Institute for International Studies, part of the University of Notre Dame’s new Keough School of Global Affairs, is an interdisciplinary community of scholars and students from across the University and around the world that promotes research, provides educational opportunities and builds linkages related to two topics critical to our world: democracy and human development. Originally published by Elizabeth Rankin at news.nd.edu on October 22, 2015.